Open Society Foundation’s (OSF) declared objective is “to work to build vibrant and tolerant democracies whose governments are accountable and open to the participation of all people.” This is the basis for OSF’s often intrusive activities in both closed and democratic societies, including large scale funding of political NGOs. Founder George Soros has sharply criticized Israeli and American policies towards the Palestinians, specifically the refusal to accept the participation of Hamas in a Palestinian government. Soros has also accused AIPAC of “endanger[ing]” Israel’s existence, and has drawn comparisons between Israel and Nazi Germany. $62.1 million was allocated to programs in the Middle East and North Africa. OSF has also provided funding to Palestinian NGOs Al-Haq the Palestinian Center for Human Rights (PCHR), both of which have links to the Popular Front for the Liberation of Palestine (PFLP), a terrorist organization designated as such by the US, EU, Canada, and Israel. In February 2014, the PFLP organized a ceremony in Gaza honoring Sourani for winning the “Alternative Noble Prize.” Rabah Muhana, a member of the PFLP Political Bureau, delivered a speech at the prize ceremony. Other OSF grantees are the Center for Constitutional Rights (CCR) and the American Friends Service Committee (AFSC), two US-based organizations that promote BDS campaigns against Israel. On August 14, 2016, leaked documents from OSF were posted anonymously on the now-defunct DC Leaks. A number of these as yet unverified documents deal with OSF’s grants to political NGOs through its “Arab Regional Office (ARO) – Palestinian Citizens of Israel” department. Headed by Ammar Abu Zayyad, the ARO is one of a number of funding mechanisms for Israeli and Palestinian NGO’s in the OSF network. 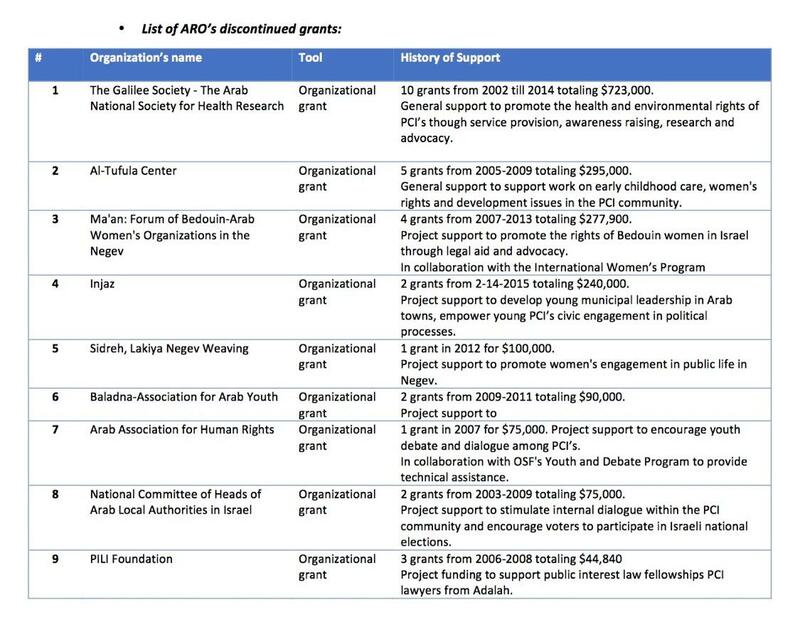 The list of ARO grantees (also in Appendix 1 below) showed that Open Society Foundation funded a number of Israeli NGOs, including some recipients that deny the legitimacy of Israel and Jewish sovereignty, and are involved in demonization campaigns. 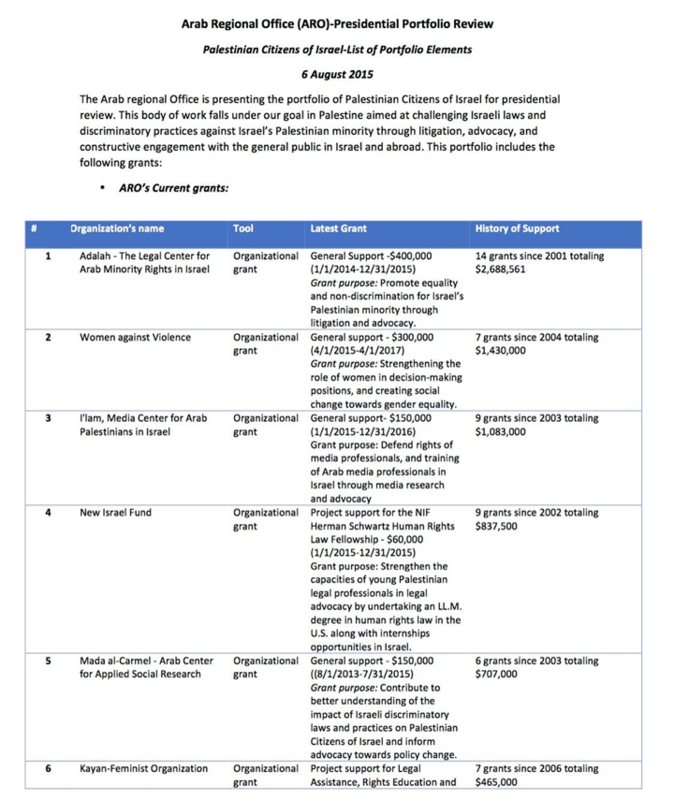 The 2013 NGO Monitor report “Bad Investment: The Philanthropy of George Soros and the Arab-Israeli Conflict” includes a number of Soros funding frameworks that are not included in the leaked documents, meaning that – if they are accurate – the actual funding is significantly higher than indicated by this leak. 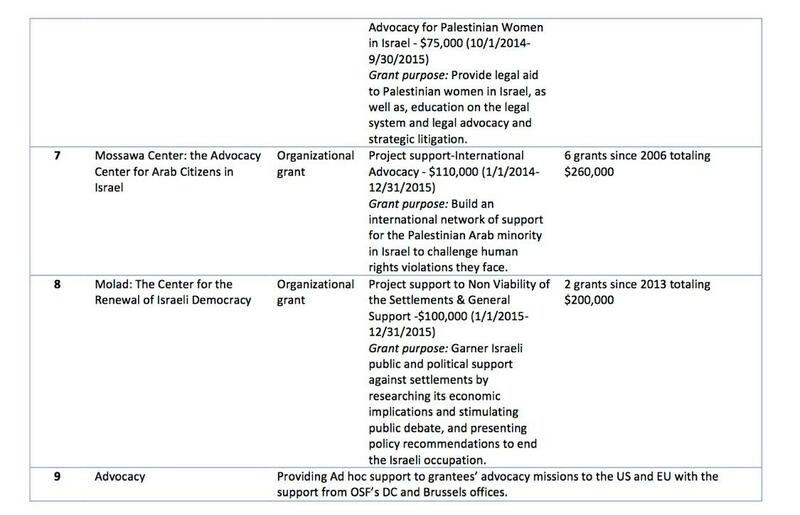 According to these documents, OSF provided $405,000 to Palestinian media outlet Wattan News from 2012-2014. In 2016, Wattan published a series of articles promoting virulently antisemitic content in the form of “anti-Zionism.” After inquiries were sent to OSF by Tablet magazine, the offensive content was removed from Wattan’s website, and OSF issued a condemnation and claimed that it is “putting in place procedures that such a serious lapse in editorial oversight will not take place again.” OSF did not state that it was withdrawing funding from Wattan. Amongst the leaked files are instructions on pressuring the EU to adopt product labeling policies touted by many NGOs as the first step to EU-sponsored BDS, and supporting Palestinian ascension to the International Criminal Court (ICC). In 2010, Open Society Foundation pledged $100 million to Human Rights Watch (HRW) over the course of 10 years. OSF has published articles by B’Tselem, Al-Haq, Breaking the Silence, Adalah, and Gisha as part of its “Grantee Spotlight” page. In October 2016, Shawan Jabarin, the director of Al-Haq, promoted the decision to label all products from Israeli communities built over the 1967 ceasefire line adopted by the EU, ostensibly calling for the eventual boycott of all Israeli products. OSF granted an unknown amount of money to the political activist Michael Sfard to write his book, The Wall and the Gate: Israel, Palestine, and the Legal Battle for Human Rights. Sfard is involved in highly political NGOs (many of them getting money from OSF) and campaigns against Israel, including lawfare. All grant information was taken from the Grant Database on Open Society Foundation’s website. Grants in New Israeli Shekels (NIS) were taken from annual reports submitted to the Israeli Registrar of Non-Profits.